With an African backdrop, English connections extend beyond the city’s name, and traces of German heritage are also seen in the well-preserved, charming 19th-century architecture. 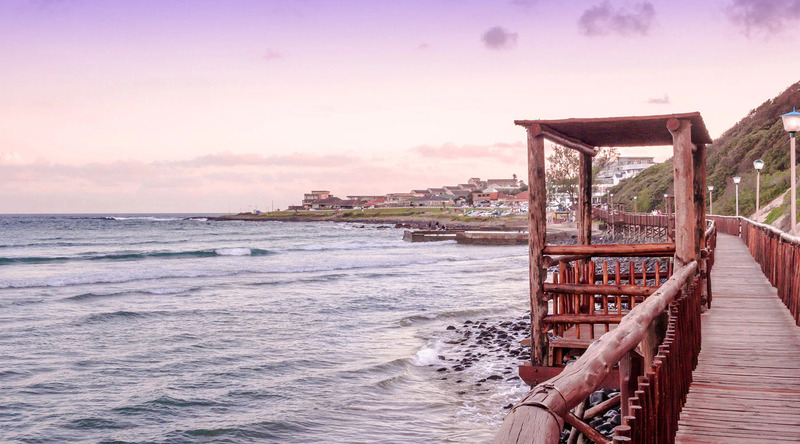 As South Africa’s only river port, East London’s prime location between the Buffalo and Nahoon Rivers offers breathtaking wildlife safaris and the Amatola Mountains inland, and some of the world’s finest beaches in each direction on the coast. Unspoiled, uncrowded, sweeping white sand and dunes are the perfect places to stroll, swim, snorkel, bird watch, whale watch, or just worship the golden sun. For ultra-rare sights and in-depth cultural discovery, tour the East London Natural History gallery, home to the world’s only egg of the extinct dodo bird, and the famous mounted coelacanth—a prehistoric fish that lived in the Indian Ocean for 400 million years and was thought to be extinct until being caught in 1938. You’ll also find exhibits on the history of the region, beautiful Nguni beadwork, and a traditional costume gallery. This mini game reserve just outside the city’s center is home to much more than lions—tigers, cheetahs, giraffes, crocodiles, white camels, zebras, and antelopes also reside here. Northeast up the Wild Coast is the famous Inkwenkwezi Private Game Reserve. Discover rare wild animals and flora spanning five distinct ecosystems for an unparallelled safari experience. A pristine beach on the beautifully rugged Wild Coast with lifeguards and security. Soak up the legendary South African sun, or watch world-class surfers carve waves in the distance. Stroll north, where the ocean merges with the Nahoon River in a calm lagoon, or south, where an expansive boardwalk leads through rolling dunes to rocky Nahoon Point. Hike along the Dassie Trail in the Nahoon Estuary Nature Reserve, discovering mangrove ecosystems, natural ponds, lush forests, and indigenous coastal flora and fauna. Kayak the Nahoon River on this 2-hour paddling adventure. Journey into South Africa's Wild Coast on this safari expedition into Inkwenkwezi, a world-class game reserve, encompassing five different regional ecosystems and a tidal estuary.